This restaurant has long enjoyed a special place in the hearts of Dubai residents, as one of the most romantic venues in the city. Recently reopened after a major makeover, Pierchic has renewed its claim to this recognition – with the Burj Al Arab twinkling nearby, the gentle ocean breeze flowing through the expansive windows, and picturesque setting, this really is one of Dubai’s most atmospheric spots. Two new ‘pods’ or drinks lounges have opened in the pier that leads up to the over-water restaurant, offering a relaxed spot for drinks, with enviable views. 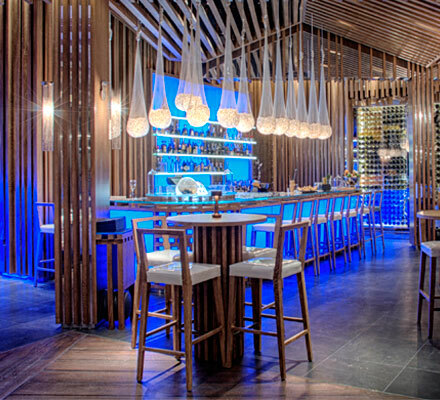 Inside, the contemporary dcor brings home the marine theme in glam style – think lit Swarovski crystals in fish nets. For starters, I opted for the grilled Loch Fynn diver scallops, served over a delicate vanilla-scented tapioca pearl custard – the dish showcased the hero ingredient beautifully, but I would have liked a bit more textural interest in there. My friend’s Cornish crab salad with asparagus, however, we both ended up almost fighting over, as it was packed with flavour. For mains, I was torn between the turbot and the lobster thermidor, but plumped for the latter, based on our friendly waiter’s recommendation, and I was glad I did – it was cooked to perfection, with a mustard sauce and roasted cauliflowers complementing the sweet flesh of the crustacean. Dover sole Meuniere was my friend’s main of choice, which came with spinach, wild mushroom, and a luxurious champagne essence – while delicious, the fish felt a bit chewy. We both really enjoyed the sides we shared, however, which include healthy options such as braised kale with white onion, sauted broccolini and parsley-tossed potatoes. Any blips on our radar so far were well made up for by the dessert course – chocolate mille feuille, a five-layer concoction that married different chocolatey tastes and textures beautifully, and my star dish of the evening, a delectable coconut pavlova with mango and passionfruit sorbet, which provided a refreshing end to a seafood meal. If you want to go: Around Dhs1,200 for two, without drinks. Call 04-3666705.